American classical composer Elliott Carter has died at the age of 103. Known for his challenging and complex pieces, Elliott Carter won two Pulitzer Prizes and was also honored with the US National Medal of Arts. While not widely known by the general public, Elliott Carter was hugely respected by critics and musicians. In 2002, The New York Times said Elliott Carter’s string quartets were among “the most difficult music ever conceived”. Elliott Carter was hailed by fellow composer Igor Stravinsky for his Double Concerto for harpsichord, piano and two chamber orchestras (1961) and Piano Concerto (1967), both of which Stravinsky dubbed “masterpieces”. Twelve years ago, during an interview, Elliott Carter said hearing Stravinsky’s famous work The Rite of Spring in the 1920s was what made him want to become a composer. His music publisher, Boosey & Hawkes, said in a statement announcing his death: “The great range and diversity of his music has, and will continue to have, influence on countless composers and performers worldwide. Elliott Carter once said he was unperturbed by his apparent lack of fame. “I don’t think it means anything to be popular,” he said. Elliott Carter composed more than 130 works, including 1942’s Symphony 1 and 1944’s Holiday Overture. His later works included Dialogues (2004), which was nominated for the a Pulitzer, and 2006’s Boston Concerto, nominated for a Grammy for best classical contemporary composition. Aldeburgh Music, which organizes the annual Aldeburgh Festival said they were “very sad” to hear of Elliott Carter’s death. His music was first heard at Aldeburgh in 1968 and he last visited the festival in 2009 aged 100. Pierre-Laurent Aimard, artistic director of the festival, said they would remember “his smile, his joie de vivre and his sense of humor”. “He was and will always remain a composer of fantasy and structure, reflective yet alive, always reinventing and yet true to himself,” he said. “By turns lyrical, dramatic, complex, amusing and poetic, this grand master of polyphony understood the challenges of his time and entertained us with great intelligence,” he added. 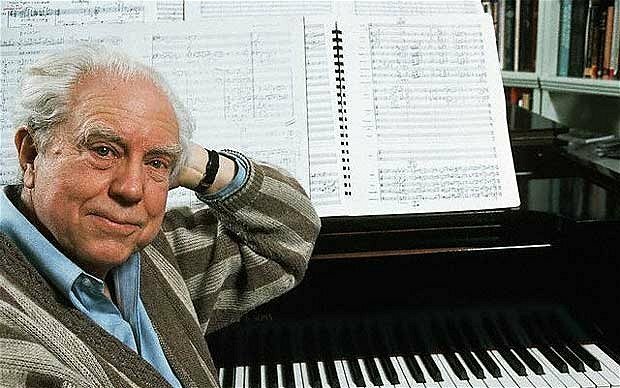 Elliott Carter’s latest work, Instances – for chamber orchestra – will have its world premiere in February next year, and will be performed by the Seattle Symphony. He won his first Pulitzer Prize in 1960 for his Second String Quartet, the second was for his Third String Quartet in 1973. In 1998, Elliott Carter was inducted into the Classical Music Hall of Fame. Elliott Carter was also honored with prestigious awards in France and Germany. He said he found Europeans were more receptive to his work because music was part of the culture, “something that people make an effort to understand”. The composer celebrated his 100th birthday at New York’s Carnegie Hall in 2008, where a new work of his was played by the Boston Symphony Orchestra. Elliott Carter was born in New York in 1908 and was first encouraged toward a musical career by his friend and mentor Charles Ives. He went on to study literature at Harvard and then studied music in Paris under Nadia Boulanger, who also taught Leonard Bernstein and Aaron Copland. It was his First String Quartet in 1951 which first brought him to the attention of music critics. In 1939, Elliott Carter married sculptor Helen H. Frost Jones. Elliott Carter is survived by his son and a grandson.